For those born February 10, 1982. You're one of the first people who's never lived in a world without MTV. In August 2011, Leah Carroll talked with MTV News anchor Kurt Loder on the network's 30th birthday. Around the time you were born, AT&T Corporation agreed to break up and divest itself of its seven regional Bell carriers. You were born in February of 1982. This year, The Atlantic celebrates its 160th birthday, making it 4 times as old as you. The year you were born, George L. Kelling and James Q. Wilson wrote about the theory behind "broken windows" policing, and how the practice could make communities safer. Clueless was released in 1995. Your life can be divided into two halves: before and after the euro. In December 2011, Jim Tankersley wrote about how the euro's failure could cause another American recession. 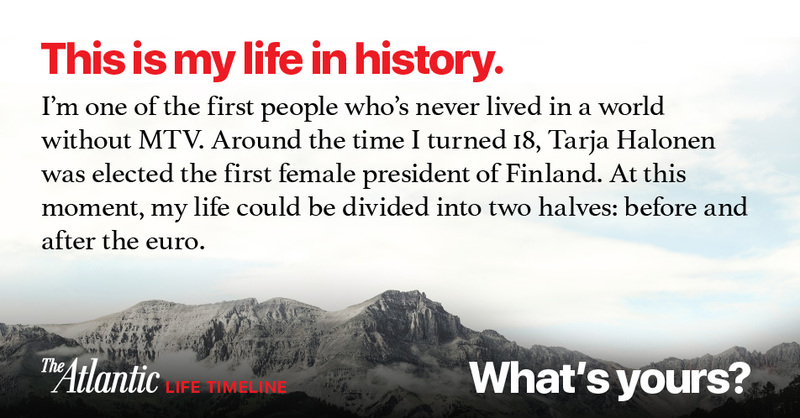 Around your 18th birthday, Tarja Halonen was elected the first female president of Finland. In June 2013, Olga Khazan wrote about how Finland is a great country for mothers and children. At 19 years old, you were part of the generation most shaped by 9/11. The conflicts and displacements touched off around the world by the attacks have been reverberating for the majority of your life. “This ‘war’ [on terrorism] will never be over,” wrote James Fallows, a few years after the towers fell. When you turned 28, you witnessed the revolutionary fervor that transformed the Arab world in 2010, a movement led by your generation. When 26-year-old Mohamed Bouazizi set himself on fire, he ignited a tinderbox of protests that continue to roil the Middle East, and kindled the beginnings of democracy in Tunisia. In 2015, Misty Copeland, who was born the same year as you, became the first African American performer to be appointed as a principal dancer for American Ballet Theatre. In August 2015, Madison Mainwaring wrote about the death of the American dance critic. By the time you turn 38, scientists estimate it will no longer be possible to keep global temperatures from rising at least 1.5 degrees Celsius.